Legius Syndrome is a rare genetic disorder characterized by multiple café au lait macules and other clinical manifestations like freckling, lipomas, macrocephaly, learning disabilities, developmental delays. Owing to the many similarities with Neurofibromatosis type 1 (NF1), Legius Syndrome was initially identified as NF1-like Syndrome. Legius Syndrome in general lacks tumors manifestation typically observed in NF1. This disorder has been named “Legius Syndrome” since the 13th European Neurofibromatosis Meeting after Eric Legius, the senior author of the paper that first described the phenotype of SPRED1 mutation in humans in 2007. Legius Syndrome belongs to the neuro-cardio-facial-cutaneous (NCFC) syndromes or RASopaties, a group of syndrome caused by mutation in gene coding for proteins with an important role in the RAS- mitogen-activated protein kinase (RAS-MAPK) pathway. RASopaties exhibit overactivation of RAS-MAPK pathway. This group includes: Noonan syndrome, LEOPARD syndrome, CFC syndrome, Costello syndrome, NF1 and Legius syndrome. These syndromes have an overlapping phenotype, although specific features can often be distinguished. This could create problems in making individual diagnosis. The prevalence is currently unknown. Current knowledge is based on the analysis of about 200 individuals with confirmed molecular diagnosis. It occurs in male and female in the same manner. The cardinal feature of Legius syndrome is pigmentary dysplasia consisting of multiples café au lait macules tending to increase with aging. Additional common clinical manifestations are: intertriginous freckling (especially in axillary/groin region), Noonan syndrome- like facies, lipomas, absolute or relative macrocephaly. Learning disabilities, developmental delay, ADHD (Attention Deficit Hyperactivity Disorder), autistic behavior and concentration problems are frequently reported in children with Legius syndrome. These children show a lower average performance IQ and more learning disabilities compared to unaffected family members, so a cognitive phenotype is probably present, anyway it is milder than that in NF1. Additional clinical features less frequently reported are: short stature (< 5th percentile), pectus anomalies, polydactyly, vascular abnormalities (hemangioma). The diagnosis of Legius syndrome is difficult to make on clinical ground alone. Clinical information and family history are very important to direct diagnosis but given the overlapping manifestations of the other RASophaties (especially NF1), it is necessary the detection of a SPRED1 mutation to confirm the diagnosis by molecular genetic testing; it is analyzed the entire SPRED1 coding region and splice sites. When no mutation is identified by sequence analysis, it should be considered deletion/duplication testing given that exonic and whole-gene deletions may be as high as 10%. When molecular diagnosis is confirmed, it could be evaluated age-appropriate developmental assessment, neuropsychiatric evaluation, detailed dermatologic evaluation. The family of patients with Legius syndrome should be offered genetic counseling. Also prenatal diagnostics (amniocentesis) and preimplantation genetic diagnosis is possible if the disease-causing mutation has been identified in the family. Legius syndrome is inherited in an autosomal dominant manner. However sporadic case have been reported, probably because of a de novo mutation in the individual or a germline mosaicism in a parent. The only gene known to be associated with Legius syndrome is SPRED1. It is located on chromosome 15q13.2, has seven coding exons and it encodes for Spred-1 (Sprouty Related Evh1 Domain-containig protein1), a protein of 444-amino acid. This protein comprises an N-terminal EVH-1 domain, a central KIT binding domain and a cysteine rich C-terminal SPRY domain. RAS/MAPK pathway is essential for the maintenance of cellular homeostasis. RAS proteins, present in three isoforms HRAS, NRAS, KRAS, are monomeric membrane GTPase involved in cellular growth, differentiation, apoptosis. The active complex RAS-GTP leads to the activation of RAF, a serine- threonine kinase, which phosphorylates the MAPK MEK1 and MEK2 activating them. MAPK in turn phosphorylate and activate ERK1 and ERK2. They are the ultimate effectors and exert their function on a large number of downstream molecules, both nuclear and cytosolic. ERK1 and ERK2 substrates include nuclear components, transcription factors, membrane proteins and protein kinase that in turn control vital cellular functions. Spred-1 negatively regulates the RAS/MAPK pathway by promoting the GTP-RAS conversion in GDP-RAS and consequently inhibiting Raf1 kinase phosphorylation and activation. Many mutations have been documented: missense, nonsense, frameshift, deletion. The vast majority of SPRED1 mutations associated with Legius syndrome produce a premature stop codon, resulting in C-terminally truncated protein product (non-functional). Mutations have been identified within the N-terminal EVH-1 domain, the KIT binding domain and the C-terminal domain. There is no documented correlation between type of mutation and phenotype. SPRED1 mutations account for at least 2% of the pathogenic mutations associated with patient clinically diagnosed with NF1. 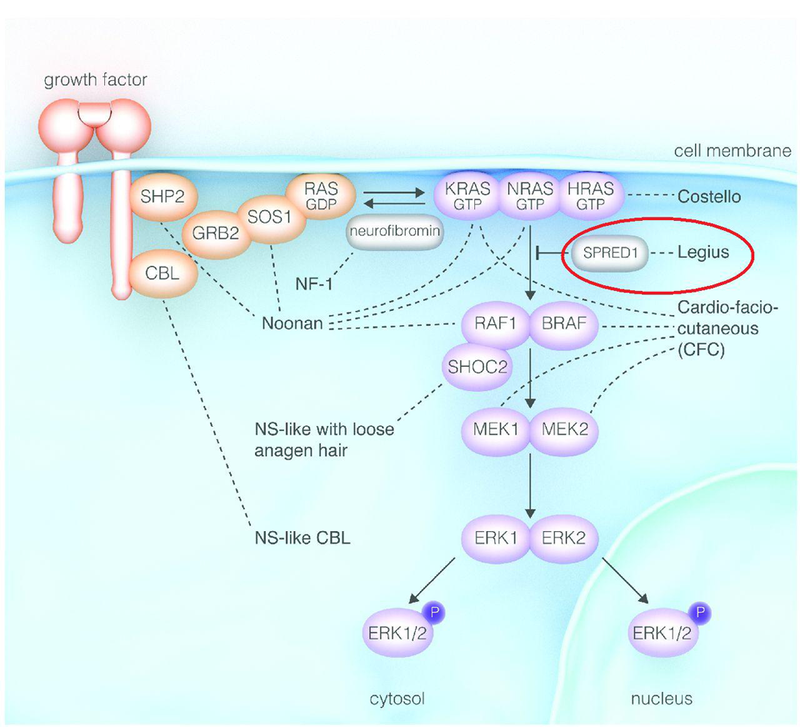 Spred1 is enriched in the central nervous system germinal zone, it downregulates neural stem cell proliferation and maintains ventricular zone structure. Human SPRED1 is highly expressed in lung, brain, spinal cord and spleen. It's demostratated in mice that Spred1 is required for synaptic plasticity and hippocampus dependant learning. It is not yet clear whether malignancies are associated with this syndrome. In Legius syndrome are absent Lisch nodules (pigmented hamartomas affecting the iris), neurofibromas, central nervous system tumors, typical tumor manifestations of NF1. However one report suggested that individual with Legius Syndrome are at an increased risk for leukemia. At the moment clinical data are available only from a relative small number of reported cases of individuals with Legius syndrome, then certain rare complications might have been missed. Further studies are needed to assess the potential risk of cancers in Legius syndrome, particularly given that SPRED1 is part of the Ras-MAPK signal transduction pathway, which is involved in several neoplasm. There is no cure for Legius syndrome. The manifestations treatment consist of consideration of behavioral modification and pharmacologic adjuvant therapy for individual with ADHD; adjuvant therapies as physical, speech and occupational therapy for individual with identified developmental delays; individualized education plans for learning disorders.